The actor model in computer science is a mathematical model of concurrent computation that treats “actors” as the universal primitives of concurrent computation. In response to a message that it receives, an actor can: make local decisions, create more actors, send more messages, and determine how to respond to the next message received. Actors may modify their own private state, but can only affect each other through messages (avoiding the need for any locks). Why should I care about Orleans, or actor model frameworks in general? In a monolithic system, you can more or less only scale “up”. With systems built using microservices, actors, etc, you have the option of scaling “out”. What does scaling “up” vs “out” mean? To scale a system up, means adding more RAM, more CPU — more resources, to the hardware in which your system runs; but you are still constrained to a single “box”. To scale “out” means you can just add a brand new machine, generally to a “cluster” of some sort, that allows your system to much more easily add additional resources. Sure, you can always add more RAM/CPU to your existing machines in a microservices system, but you also have the option to have more machines! Options are always nice! What does this all mean? With all the cloud services, containerization, and VMs readily available in today’s world, it can be extremely simple to spin up and down resources as necessary. Just add a new node to the cluster! Grains — the “virtual actors” and/or “primitives” that are described in the actor model definition above. Grains are the objects that actually contain your logic that is to be distributed. Each individual grain is guaranteed to operate in a single-threaded execution model as to greatly simplify the programming, and avoid race conditions. The grains are written in an asynchronous manner, and are intended for very fast running operations (< 200ms IIRC) — though I’m using it for operations that take MUCH longer, maybe I can do a post about that at some point if everything works! Silos — the area where your “grains” are kept. A silo can contain many grain types, as well as many instantiations of those types, depending on your needs. Clusters — a collection of silos. This allows for the “scale out” portion of Orleans. 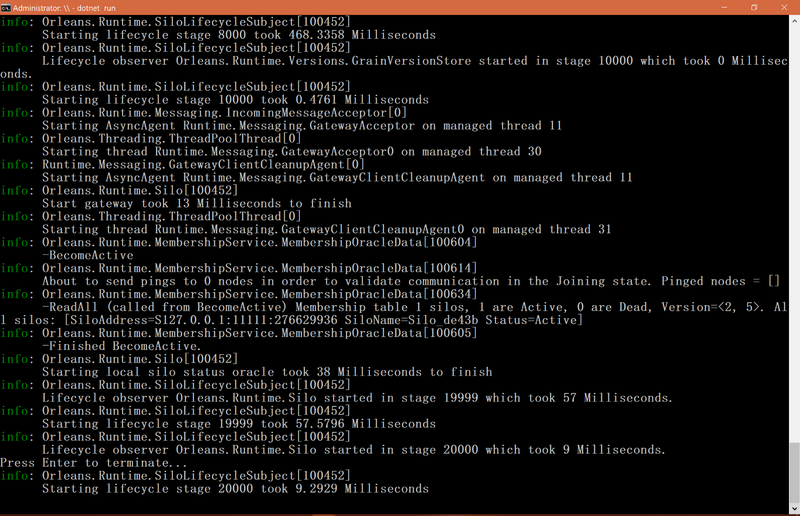 If more or less resources are needed, you can simply register or kill silos on your cluster. Scaling made easy! Note this image should also show SiloHost depending on the “Grains” project — I missed it at the time of taking the screenshot. Note in the image and repo linked above I had missed a dependency at this point. The SiloHost project should additionally have a reference to the Grains project, that would not be reflected in the above point in time. You could also go ahead and add references to Microsoft.Extensions.Logging.Console in the Client/SiloHostas well (will be needed later). Let’s start with the most basic example — hello world. This won’t really show off what Orleans can do very well, but we have to start somewhere right? IHelloWorld implements IGrainWithGuidKey — an interface that defines an Orleans grain, and its key type. I believe all key types get converted to a Guid in the end anyway, so this is what I usually stick with unless there is some unique contextual data that can be used for grain identification. Task<T> — all Orleans grains should be programmed in an asynchronous manner and as such, all grains will return at a minimum Task (void), if not a Task<T> (a return value). The above grain interface simply takes in a string name and returns a Task<string>. Again, mostly standard stuff here. We’re extending a base Grain class. implementing from our IHelloWorld, and providing the implementation. There’s really not much to our method, so AFAIK no reason to await the result (can someone correct me if I’m wrong? Async/await is still quite new to me). We now have all that is necessary for Orleans to work, aside from that whole Client/Server setup and config — on to that next! Next is the client and server setup, which we’ll be doing in our currently untouched projects of Client and SiloHost. Note the below configuration is specifically for development, it does not, and cannot operate as a cluster of nodes (AFAIK) like a production configuration can/should. In the above there’s a fair amount of logic going into making sure we can successfully get an instance of IClusterClient. This bootstrapping of the client only needs to be done in one place (and if you have multiple applications that use the same client, could be extracted to a helper class). The actual “work” of the IClusterClient from a grain perspective is all done in the method DoClientWork. That should be everything we need to get our Orleans demo working — and luckily the client/server configuration doesn’t really change much after its done, though the initial setup can be a bit tricky (most of the reason why i just copied the sample’s example). Note: I added an additional NuGet package to both the Client and SiloHost projects to allow for pretty logging within the console window. With an Orleans project, your normal application (Client as example) is reliant on the SiloHost being up and running. There is some retry logic built into the above client implementation, but not a bad idea to bring up the server prior to the client. Your silo host should now be up, running, and await requests. 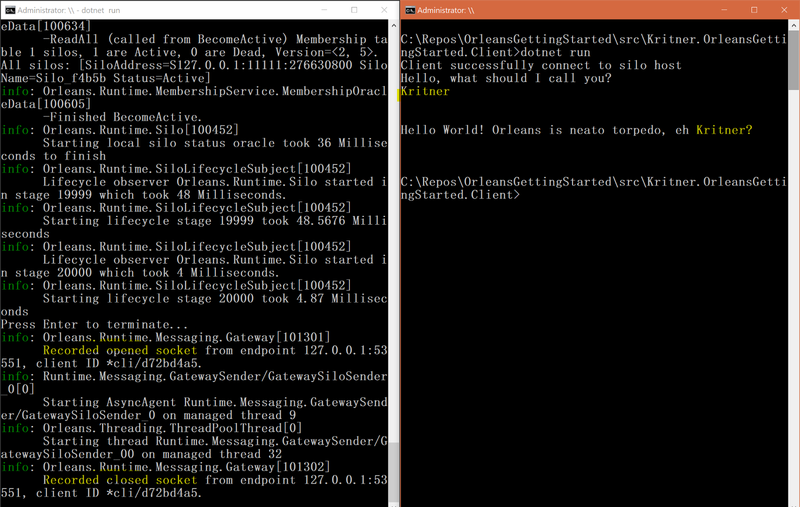 The left side is the Logger info from the SiloHost, and on the right is the Client app. You can see through the highlights that the SiloHost opened a socket when the client connected, and closed it the client completed executing. On the client side, you can see that we entered our name, and the Orleans SiloHost sent it back! The above is of course, just a simple example, but it helps set the foundation of potentially great things to come! Updating Orleans Project to be more ready for new Orleans Examples! 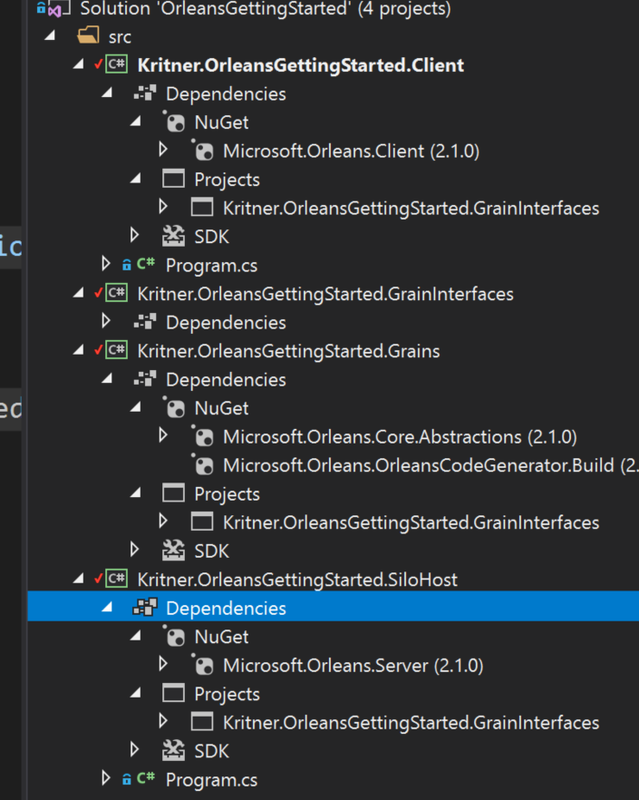 Microsoft Orleans — Code Generation Issue? Microsoft Orleans — Easily switching between “development” and “production” configurations.